- Installation hole size :1.25"-1.37"
- 2 x 19.6-inch Flexible connection hoses in 3/8"
ROVATE is specialized in producing and selling plumbing products. Faucet package includes water hoses with 3/8" female compression connector, U.S. standard size. If you don't like our product, you can always return to us in 30 days while you receive the product. We will fully refund you as long as the product is in new condition. 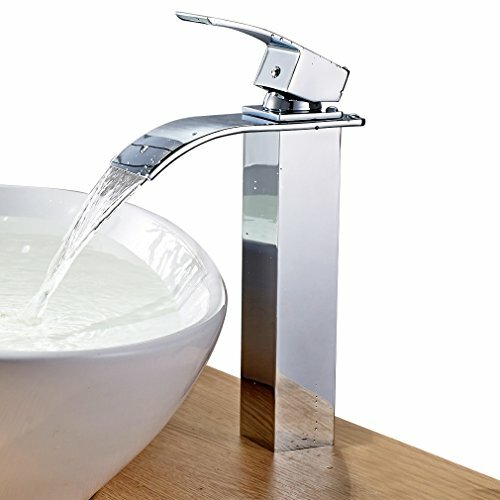 DIMENSION FOR VESSEL SINKS -- Faucet height: 11.02", Waterfall spout height: 7.87", Spout width: 2.36", Spout Reach: 3.93", Installation hole size :1.25"-1.37"
If you have any questions about this product by ROVATE, contact us by completing and submitting the form below. If you are looking for a specif part number, please include it with your message.